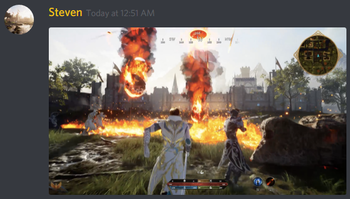 PvP (Player versus player combat) is the catalyst for change in Ashes of Creation. 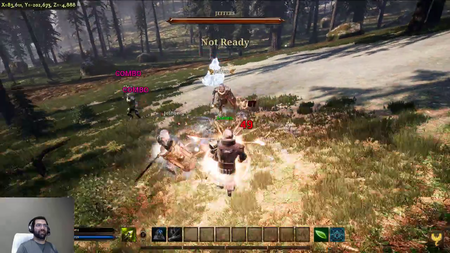 Player combat is intended to be meaningful, ranging from Caravan battles to vast open world conflicts fought for the pride of Kings and Queens. There are many reasons to engage in open world PvP in Ashes of Creation. There are no predefined factions in Ashes of Creation. Castle Sieges are intended to be massive events with hundreds of people involved in a single Siege. One of the reasons that Ashes of Creation Apocalypse exists is so we can address the challenges in ramping up the number of bodies that we can handle simultaneously. With our latest test hitting over 200 simultaneous players, we’re ready to push that number even further. Our goal is to have the largest organized PVP battles of any MMORPG. 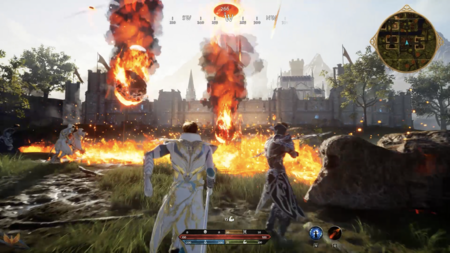 Guilds participate in Castle sieges in an effort to capture and occupy one of the five guild castles in Ashes of Creation. Sieges occur once a month. The minimum goal is for 250x250 players to be on a single battlefield. It is hoped that this can be increased to 500x500 over time. A guild that captures a castle will own that castle for a month before it is sieged again. 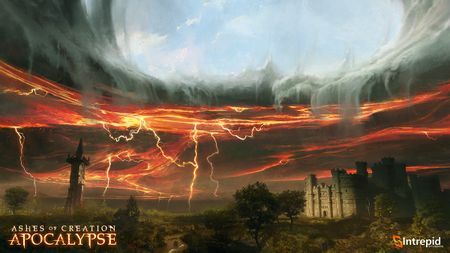 In the first three weeks that a guild occupies a castle they will need to level up each of their castle nodes to Village stage through questing. The fourth week is declaration week, where other guilds have the opportunity to lay down their declaration flag or to sign up as a defender of the castle. Depending on how well the guild defends the castle nodes results in better defenses for the castle. Different siege weaponry will grant the attackers the ability to destroy walls, doors and sections of the castle in order to gain access to the inner keep area. When castles change hands (following a siege), some taxes stay with the castle and some stay with the guild. Node sieges enable players to delevel a node (reverse its advancement) and to ultimately destroy that node entirely. This paves the way for new development and access to the locked content in surrounding nodes. Due to this dynamic, political strife and intrigue play an important role in the structure of the world. Sieging nodes will not be an easy task for the attackers. Cities and metropolises will have a considerable defensive advantage. Automatic PvE sieges may be initiated against nodes that are not continuously active. Hunting grounds are open-world PvP corruption-enabled areas that encompass most of the map. 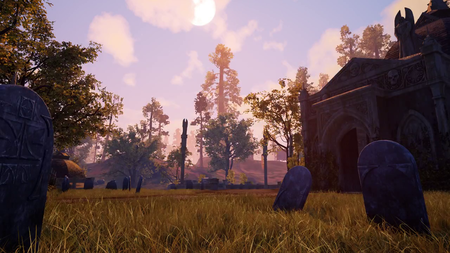 Hunting grounds refer to killing monsters or NPCs in the open-world. This also refers to contesting resources. Our PvP mechanics follow a flagging system, as well as static PvP zones at certain points of interest; fight for control over cities, castles, caravans, or hunting grounds. Our PvP is designed to offer the players a well-balanced and fair world to shape through the pen, or sword should they choose. Pre-alpha arena combat footage from PAX West 2017. Arenas are instanced PvP scenarios and are not part of open world PvP. There will be an arena ladder system. Rewards for arena ladders will be revealed at a later time. 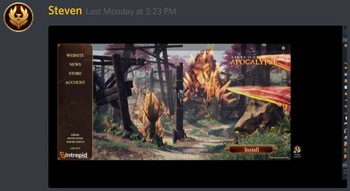 Titles can be received from arena play. Arena points that can be used to buy gear are not currently in the design. Mayors of military nodes are chosen from citizens through last man standing (gladiatorial arena style) combat. 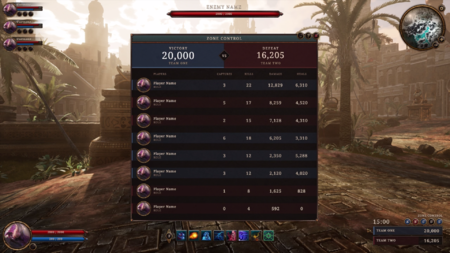 The arena system may support cross-server combat. Cemetery concept art by Tad Ehrlich. Dropping a percentage of carried raw materials. This includes a percentage of items carried on the player's mule. A combatant (purple player) who dies suffers these same penalties, but at half the rate of a non-combatant. These dropped items may be looted by other players. Corrupt players respawn at random locations in the vicinity of their death, not at regular spawn points. Dampening (due to corruption) only affects PvP combat. Death penalties do not differ between PvP and PvE, but this is subject to change. Death by drowning is possible. Players are not be able to be attacked or robbed while occupying a player stall. Player stalls may not be renewed during a siege declaration. Players will be able to lock a freehold. Freeholds will have access lists. Co-ownership is planned but may not initially be in the game. Access lists can be used to mimic co-ownership. Payment of taxes may be via a "gentleman's agreement". Players cannot steal from a Freehold under normal circumstances. Items stored in a Freehold may become lootable after a successful siege against their parent Node. Players cannot be killed by other players while inside (the footprint of) their freehold. NPC guards that permanently exist on a freehold are not a planned feature. Guards may be available for hire to defend freeholds after a successful node siege. Q: We were discussing in chat earlier about freeholds and whether or not a person would be safe in their home or within the entirety of their freehold from getting player killed? 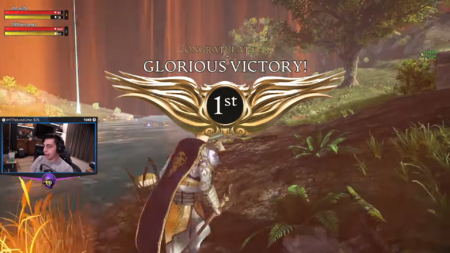 Ashes of Creation gathers tracking data to facilitate achievements, titles and other accolades on a server. Number of successful siege defenses. Number of successful siege assaults. There will be a duel mechanic. There will be a way to auto-decline duel requests. There will not be equalized PvP in the open world. There may be equalized PvP in certain arena battlegrounds under specific circumstances. ↑ Livestream, 15 December 2017 (40:26). ↑ Ashes of Creation FAQ. ↑ 4.0 4.1 4.2 Video, 30 April 2017 (5:31). ↑ Livestream, 26 May 2017 (39:36). ↑ Livestream, 8 April 2018 (PM) (11:27). ↑ 8.0 8.1 8.2 8.3 8.4 Livestream, 5 May 2017 (14:26). ↑ 12.0 12.1 About Ashes of Creation. ↑ 13.0 13.1 13.2 Livestream, 15 May 2017 (45:20). ↑ Livestream, 22 May 2017 (40:41). ↑ Livestream, 4 June 2018 (58:19). ↑ 27.0 27.1 27.2 27.3 Podcast, 23 April 2018 (21:55). ↑ Livestream, 23 August 2017 (23:00). ↑ Video, 4 December 2016 (0:02). ↑ Blog - Know Your Nodes - Advance and Destroy. ↑ 32.0 32.1 A reactive world - Nodes. ↑ 34.0 34.1 34.2 34.3 Podcast, 4 August 2018 (1:54:15). ↑ 35.0 35.1 35.2 Livestream, 22 May 2017 (52:01). ↑ 36.0 36.1 36.2 Livestream, 15 May 2017 (17:20). ↑ 37.0 37.1 37.2 Livestream, 1 June 2017 (35:42). ↑ 38.0 38.1 Livestream, 9 July 2018 (44:56). ↑ Livestream, 17 November 2017 (45:17). ↑ Livestream, 23 August 2017 (16:44). ↑ Livestream, 5 May 2017 (16:53). ↑ 47.0 47.1 47.2 Podcast, 11 May 2018 (52:20). ↑ Livestream, 26 May 2017 (29:13). ↑ 51.0 51.1 51.2 Livestream, 12 May 2017 (24:52). ↑ 53.0 53.1 53.2 53.3 53.4 53.5 Interview, 27 April 2017 (0:17). ↑ 58.0 58.1 Podcast, 23 April 2018 (49:21). ↑ 59.0 59.1 59.2 59.3 59.4 59.5 59.6 59.7 59.8 Interview, 11 May 2018 (58:07). ↑ 61.0 61.1 61.2 61.3 61.4 61.5 61.6 61.7 61.8 61.9 Podcast, 5 May 2017 (43:05). ↑ 63.0 63.1 Livestream, 17 November 2017 (35:20). ↑ 67.0 67.1 Livestream, 4 June 2018 (2:18). ↑ Livestream, 9 July 2018 (20:41). ↑ Livestream, 19 May 2017 (13:37). ↑ Livestream, 27 September 2018 (47:46). ↑ Interview, 11 May 2018 (15:41). ↑ 73.0 73.1 Interview, 27 April 2017 (9:28). ↑ Interview, 11 May 2018 (3:43). ↑ Livestream, 15 May 2017 (36:23). ↑ Livestream, 28 July 2017 (50:22). ↑ 77.0 77.1 Livestream, 16 October 2017 (59:39). ↑ Livestream, 19 May 2017 (26:40). ↑ Livestream, 9 February 2018 (51:57). ↑ Livestream, 17 May 2017 (1:03:23). ↑ 81.0 81.1 Interview, 8 August 2018 (6:44). ↑ 82.0 82.1 Livestream, 18 January 2018 (31:05). ↑ Livestream, 19 May 2017 (28:04). ↑ 84.0 84.1 84.2 84.3 84.4 84.5 84.6 Podcast, 4 August 2018 (1:47:21). ↑ 87.0 87.1 Podcast, 4 August 2018 (1:35:58). ↑ 89.0 89.1 Interview, 20 October 2018 (3:25:46). ↑ 90.0 90.1 90.2 90.3 90.4 Interview, 20 October 2018 (9:10). ↑ 91.0 91.1 91.2 91.3 Livestream, 27 September 2018 (34:49). ↑ Livestream, 15 May 2017 (34:59). ↑ 93.0 93.1 Livestream, 24 May 2017 (48:00). ↑ 101.0 101.1 101.2 101.3 Livestream, 5 May 2017 (33:25). ↑ 107.0 107.1 Livestream, 31 October 2018 (35:00). ↑ Podcast, 4 August 2018 (1:07:59). ↑ 110.0 110.1 110.2 110.3 110.4 Interview, 24 August 2018 (13:17). ↑ 111.0 111.1 111.2 111.3 111.4 111.5 111.6 Livestream, 17 August 2018 (30:29). ↑ Podcast, 11 May 2018 (57:42). ↑ 114.0 114.1 114.2 Livestream, 1 September 2018 (1:05:10). ↑ Livestream, 31 October 2018 (38:47). ↑ 121.0 121.1 121.2 121.3 Livestream, 1 September 2018 (56:11). ↑ 126.0 126.1 126.2 126.3 126.4 126.5 126.6 Livestream, 1 September 2018 (54:06). ↑ 127.0 127.1 127.2 127.3 Castle Siege Overview. ↑ 132.0 132.1 132.2 132.3 132.4 132.5 132.6 132.7 Interview, 8 August 2018 (4:00). This page's content was last modified on 26 March 2019, at 23:50.